As MS Dhoni won the toss and decided to field first, all of us expected this to be one of the games of the tournament. KKR had the worst of starts losing 4 wickets in the powerplay. Deepak Chahar picked up 3 wickets during this time and Harbhajan Singh picked up Sunil Narine with his deceptive pace. The pitch was definitely assisting the spinners as it was slow, low and was turning. 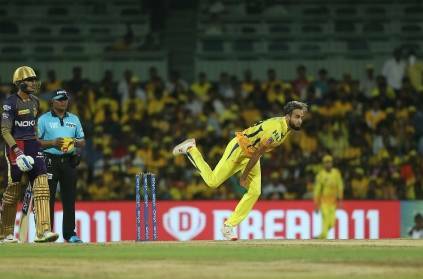 Dinesh Karthik looked like he was set to play a long innings but threw his wicket away trying to take on Imran Tahir. Andre Russell who has been having a powerful tournament struggled to get the big ones away on this pitch. Towards the end, he was just looking to hit sixes and refused singles since he didnt have partners at the other end. In spite of struggling, a few big hits towards the end helped him get to 50 from 44 balls to take KKR to 108 in the 20 overs. The CSK bowlers had a brilliant outing with Chahar finishing with 3 wickets for 20 runs, Harbhajan Singh getting 2 wickets for just 15 runs, Jadeja picking up 1 wicket for 17 runs, and Tahir getting 2 wickets for 21 runs. In spite of Russell's efforts, this should not be a tough task for CSK, also considering the due coming into play. Sensible cricket will take them through easily. This page contains news relating to various facts and events. The views are generally about current affiars and general topics in diversified areas such as political, international, national, and regional issues, sports, health, travel, lifestyle, technology and business. People having similar interets on the above topics will find this page useful. CSK vs KKR mid innings report. CSK dominate. | Sports News.